The staff at the Y are wonderful! The thing I like best is that everyone is always quick to smile and say hello. It really makes me feel at home. I love that they all seem to know my kids and I. I’ve had many wonderful experiences with the Y staff. Some that stand out are: when it was pouring rain my son was in an infant carrier and I had my 3-year-old with me, and one of the staff offered to help me out to the car with my kids. Another time, Deb searched high and low for my daughter’s doll’s shoe even after we left and found it. The most special relationship I have though began to develop when my son was an infant. Terri in child watch was the only one that seemed to be able to soothe him. At the time we didn’t realize all of his cries were due to a painful infection. We just thought we had a fussy baby. I was at my wit’s end at home and to be given some “me time” at the Y was a saving grace. Terris continues to be my son’s favorite. Also during this rough patch, Michelle rocked him in his stroller for an hour to keep him sleeping while I took my daughter to swim lessons. I continue to be astonished at the impact my simply being employed by the YMCA has on my life and the lives of my children. Recently, all employees were assigned an online training course through Redwoods on the subject of Child Sexual Abuse prevention. I procrastinated, as it was a subject I was loathe to think about, especially as the mother of two school-aged girls. A few days ago at our weekly Director’s meeting, the subject was broached again – this time with a deadline. I took a deep breath and decided to forge ahead that very afternoon. Unsure of what I’d be dealing with or how intensive the training might be, I chose to take the course at home, away from interruption. The training was not nearly as harrowing as I had anticipated, and it helped to open my eyes a bit to small, simple things that I could observe throughout the day in our facility and programs. I felt far more educated on the subject, and much better equipped to handle any abuse situations that may arise. Just as I was finishing the post-test, my 10-year-old daughter walked in and asked what kind of work I had been doing. I explained that I had been learning about how to keep kids safe from other kids and adults who may want to hurt them. We then proceeded, much to my surprise and completely out of the blue, to have an in-depth conversation on the subject. Unscripted and spontaneous, my daughter and I covered topics I had been dreading. I went back through to certain parts of the training to ask her opinions on the ‘uneven power dynamic’ section, and learned a lot about her. I was so proud of my firstborn – we were able to discuss scenarios and appropriate behavior in a safe, trusting environment. Accessing the ‘appropriate vs. inappropriate touch’ scale was extremely useful; she and I were able to share our opinions on what was okay and what was not. I was amazed at her insights, and I was able to teach her a few things as well. All in all, it was an amazing, enlightening experience, and I feel so fortunate to have had the opportunity. Had it not been for a simple directive to take a training, the conversation would not have existed in that incarnation. I am grateful to Redwoods for having put together such a wonderful training, and I am grateful to the Y for giving me the opportunity to participate. My gratitude, however, is strongest for the Living Our Cause initiative: without it, I would not have the knowledge or the ability to use the simplest, most effective tool of parenting – Conversation. 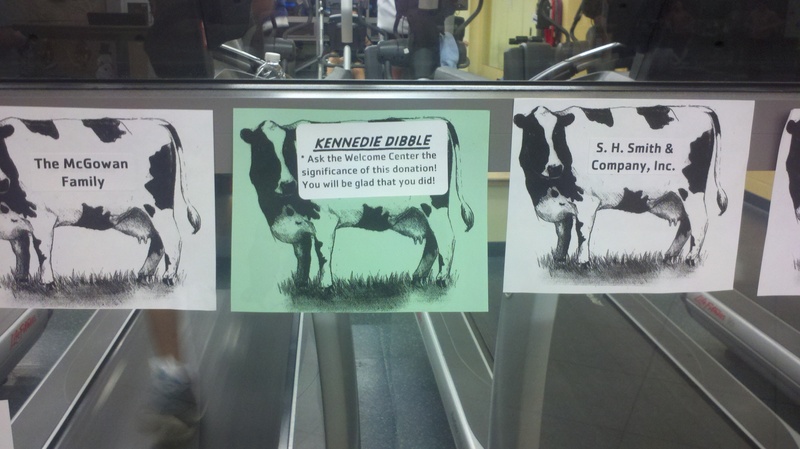 Our lobby is lined with cows for each Strong Kids Campaign donor….but now we have a GREEN cow! Why? This is a special cow. This cow represents a donation from a TWELVE YEAR OLD girl who gave Christmas money so that she can help another child in need! What a role model! Tonight – LiveStrong at the Y – first night of wellness assessments. The “Ready To Be Fit” room was filled with about sixteen cancer survivors, mostly mature women. The energy was potent. Sara drew my attention immediately, since she was by far the most frail of the group, and also the youngest. Her expression was blank, her eyes sallow, and her orange head cap was a stark contrast to her pale, almost translucent complexion. She sat on a recumbent bike not for exercise, but due to her inability to stand for any length of time. Her father stood next to her, stone faced with the look of exhaustion. They both shared a look of….fear. I introduced myself to the group of women just inside the door, which was in proximity to Sara and her father. After some typical relationship building small talk, I invited the group to randomly pick a card out of the Big Picture deck. I asked each person to tell how the picture reminded them of a memory of when they were younger. The activity went great; the women laughed about what they shared. Then it was Sara’s turn. Her frail hand held out a picture of a man and women walking hand in hand. She said “this reminds me of when I could go hiking with my father”. She turned and held an emotionless stare at her father. Her father managed a weak smile and said, “that’s why were are here sweetheart….so we can go hiking again”. That brought a big smile to both of their faces, and for an extended moment, no one else in that room existed but the two of them. The love between them was so overwhelming that I felt like an intruder in their intimate moment. A daddy and his little girl. Those smiles displayed hope, and that hope can vanquish their fear. I wrapped up the activity, and the group moved on to the assessments. And I gave thanks to all those who make the LiveStrong at the Y program possible. A few questions into this activity, two ladies in the middle of the group yelled out that so far, they had the same name and were the same age. Can you imagine the rest of the story? Yup, same favorite color, ice cream flavor and meal (really, you’re wondering about the instructor question? Stop it, they love me!). These two women had been coming to aqua aerobics together for months, but had never exchanged a word of greeting. Of course they continued to share together, only to discover that their husbands shared the same type of job! I can’t decide if this story makes me more excited or more creeped out, but I do know that it has solidified for me how very important the intentionality of building relationships must become for every YMCA staff member. Only time will tell how the relationship that started in the Indian Valley Family YMCA pool turns out, but it started and that is the whole point…because today, the community is a little stronger than it was before our class, and that is “Living the Cause”. We sent Laura a thank you email for her thank you card! We told her how this note was passed around like the winning lotto ticket because there was so much excitement about the praise! The staff work so hard to make connections and lasting relationships and it really shows in so many ways– it’s just so nice to have someone take the time and care to share how much their efforts meant to them! Today at the Downtown YMCA we had a new member arrive ready to take her very first steps on her health and wellness journey. She had never been in a “gym” before in her life. The trainer on the floor was with a Livestrong Participant conducting the final test, and I was covering the welcome center. How do you engage a member when all staff are committed to a task that they can not surrender? The answer: Engage another member. I spotted Zaida on the wellness floor (Zaida is here everyday) introduced her as one of our most committed and dedidcated members to Shirley and asked her to assist Shirley with the Treadmill until Tim could help her out. Then 10 minutes later, our new intern arrived, and I directed Julia to help out Shirley. Julia brought her through a work-out. The end result – Zaida was happy and honored to help, Shirley received exceptional service and met at least 4 people and now has scheduled wellness appointment. Julia had a great first hour of an internship. And our Livestrong Particpant showed a marked improvement. Go Team! The Indian Valley YMCA is located in Ellington, which is a growing town surrounded by farms…..dairy farms to be precise. It is for that reason that we chose “IVY the Cow” to be our mascot for this year’s Strong Kids Campaign. We have a large wooden cutout of IVY the cow climbing the wall on over a large “cow spotted” thermometer. IVY has a quote bubble proclaiming our current raised to date. We have the staff wearing cow spotted “ask me why” t-shirts….we have cow cutouts with the names of donors lining our hallway. All of this has certainly attracted the attention of our members….including our youngest members who run up to the cow each day to show mommy or daddy. Most importantly, along the thermometer, we have posted Impact Stories. 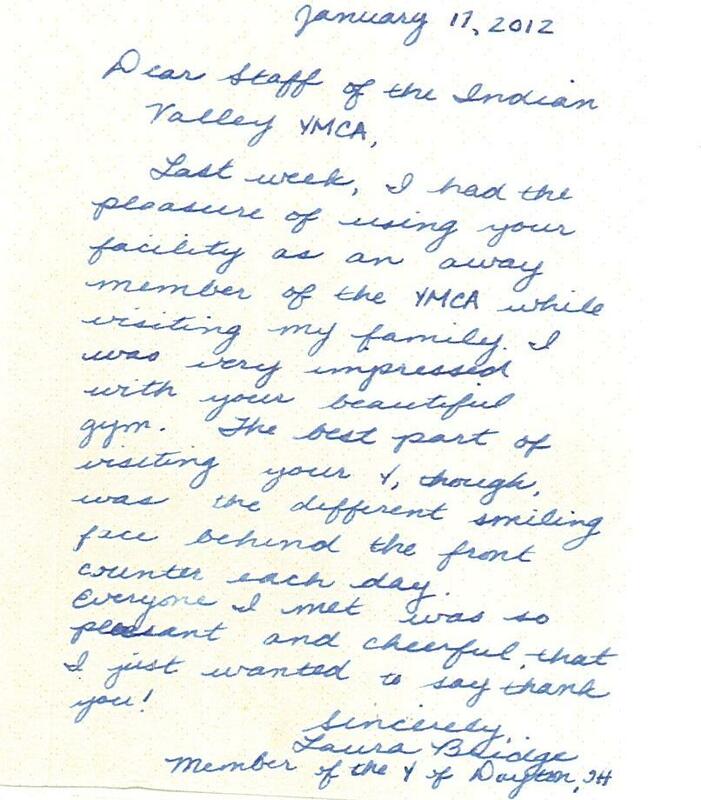 I can hear from my office kids saying “what does that say daddy?”….and daddy summarizes the story of how the YMCA has impacted a family. I never saw this coming….what an amazing way to teach kids about donating, helping those in need, and how a cow can help! At the end of every yoga class we bow and say “Namaste” (“I honor the light within you.” I have also been suggesting that they turn to another “yogi in the group and bow to them saying “Namaste!” and they do! Today I asked them to introduce themselves to the person sitting next to them and they did. Class is pretty quiet and meditative in nature, so not a lot of talking goes on, but I encourage questions at the end and I see groups talking to one another. Chair yoga is small, so far 1-4 persons so it is easier to converse during the class, talking about what’s working and what isn’t. Also introductions happen easily.